It’s not quite the standard touchdown call in my role as the Voice of the UB Bulls. But much like a UB touchdown, there is recent news that will make Bulls fans stand up and cheer. Bulldozers, cranes and construction equipment will soon be in sight beyond the scoreboard at UB Stadium. New York State has finally given its approval to the University’s plans to build a Fieldhouse for the athletic program. A groundbreaking should happen this fall. This is a huge, significant step for the future of all the Bulls teams. The construction of a Fieldhouse has been in the works since UB made the move to Division I. Funding challenges, administration changes and the general snail’s pace of getting anything done in Albany have all delayed the project. Until now. UB was one of only two schools (Ball State) in the Mid-American Conference to not have an on-campus indoor facility. That put the program, and especially the football team, in a very difficult position. Recruiting these days is as much about facilities as it is coaches, tradition and education. That’s just the reality. That’s why Texas is spending $10,000 each on new lockers for the football team, and Clemson’s new football facility has a nap room and a bowling alley. Even though the Bulls used the Bills Ad Pro Sports Fieldhouse, not having its own on-campus facility likely cost them athletes who could help their teams win. Not to mention the expense of transportation to Orchard Park and rental fees to the Bills. Plus, that 30-minute ride created scheduling challenges for the student-athletes. How did it finally happen? We’ll find out when the school officially makes the announcement. But I know that loyal and passionate donors stepped up with their wallets. They want the Bulls to win, and they know this goes a long way towards making that happen. Credit also goes to Athletic Director Allen Greene and Deputy Director of Athletics Eric Gross. Along with past AD’s and staffers, this has been a mission for the department. Trust me when I tell you this is a game-changer for the program. You can’t be one of the only one of your conference colleagues to not have this. Especially in Buffalo, where the weather is a challenge. This will be the difference in getting that future running back who will help UB win, and won’t go to a MAC rival. Many of you may know that I have been the Voice of the Bulls since 1993. That means I have seen the program struggle from its days as a Division III school and the meteoric escalation to Division I. Yes, that rise has taken place in less than 25 years, a millisecond in the tradition-filled world of college sports. Conference rival Western Michigan will play its 111th season of football this year. It also means I understand how the process works and the hard work that goes into making a program successful. The Bulls football program hasn’t yet become a consistent winner. Part of the reason is a lack of a Fieldhouse. Now, that addition will go a long way towards the goal of consistent winning. There has already been reaction to this news by fans who have negatively tied this to the dropping of four sports a few months ago. Many of those coaches were my friends, and many of those athletes are people I have gotten to know. I feel terrible for them. But fans need to understand that the funding for this Fieldhouse is coming from money specifically earmarked for this facility. My understanding is no money was taken from those sports and put towards this project. The building of the UB Fieldhouse will now make all the sports stronger, which will lead to more winning, which will lead to more fan support, which will lead to what all of us college sports fans desire. 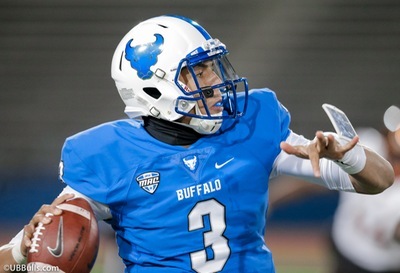 A UB Bulls program to be proud of.